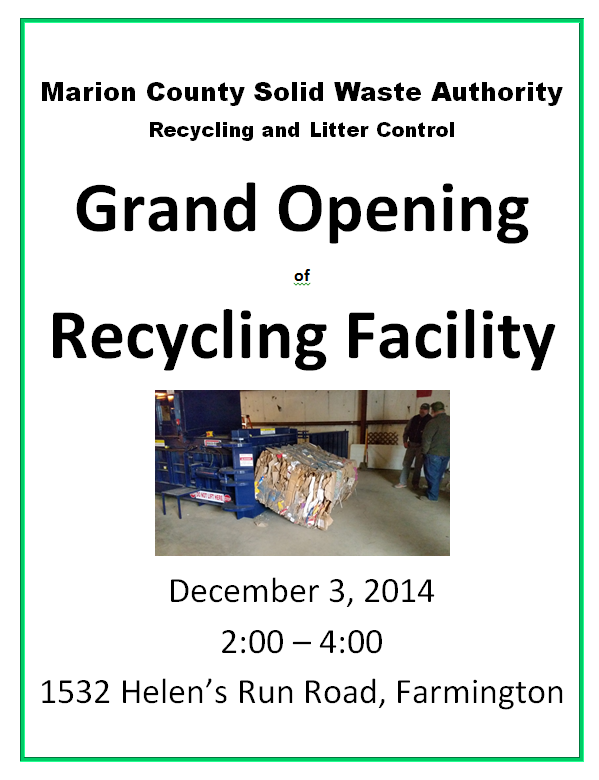 We are so proud of our residents who made this possible through increased recycling in Marion County. Your aluminum and steel cans, cardboard, paper, and #1 and #2 bottles add up to our new Marion County Solid Waste Authority, Recycling & Litter Control recycling processing facility. If you are interested in getting involved with recycling & litter control in Marion County, please join our Recycling & Litter Control Task Force. Residents like you make Marion County a more beautiful place to live! 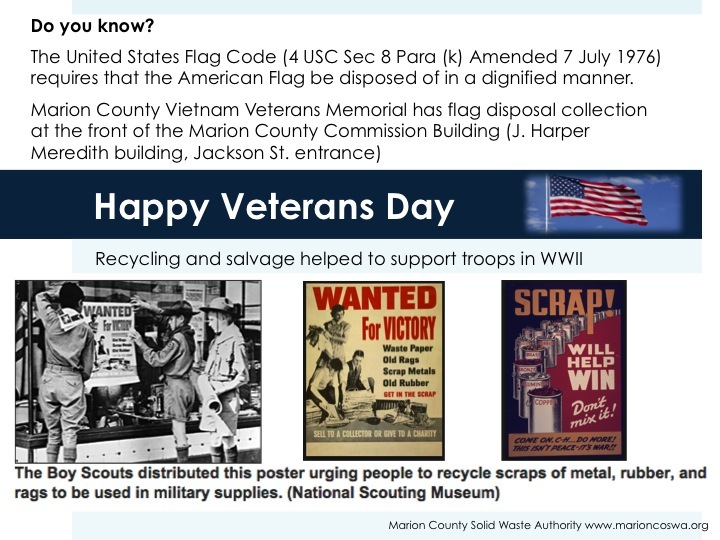 The Marion County Solid Waste Authority, Recycling & Litter Control has a lot to celebrate for America Recycles Day 2014. Marion County Solid Waste Authority recently won the 1st Place WV DEP Clean Counties Award (the first for this region), Bobbi Benson, Executive Director was awarded a 2014 Conservation District of the Year Award, and the regional USDA Project ALERT through Marion County Solid Waste Authority completed a successful year long project. But the BIGGEST of all is that Marion County Solid Waste Authority, Recycling & Litter Control just received two BALERS to start recycling collected commodities at the facility. These include materials collected at our drop off sites: #1 and #2 plastic bottles, aluminum cans, steel (tin) cans, paper, and cardboard. NO GLASS can be accepted at this time. The Marion County Solid Waste Authority, Recycling & Litter Control is proud to announce that the Marion County Solid Waste Authority won 1st place in the 2014 WV DEP Clean County Award thanks to our dump site clean ups, increased education and outreach, special collections, Project ALERT, and the efforts of many stakeholders and community groups throughout Marion County. The WV Clean County award is a tremendous honor because this the first time our region of West Virginia has won this prestigious award. Special thanks to our Litter Control Officer, Ben Smith; our WV DEP Officer Scott Lemons; our WVDNR Officer Randall Kocsis, Day Report Supervisor Walt Colley, Marion County Commission, and Make Marion County Shine. 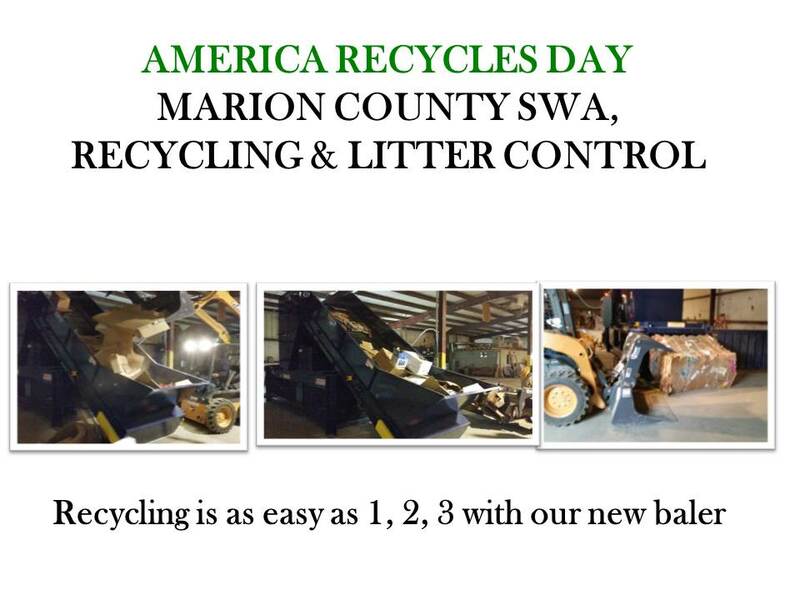 Recycling and Litter Control Makes Marion County WV a Better place to live because of RESIDENTS like you! Interested in getting involved or helping your city or town win next year’s Clean Town award? Want your group to get an Adopt a Highway Sign, please attend our next Marion County Solid Waste & Litter Control Task Force Meeting. Thank you to everyone who attended the 1st Marion County Solid Waste & Litter Control Task Force meeting on a spooktacular Halloween from Bobbi Benson, Ben Smith, the Marion County Solid Waste Authority Board and the Project ALERT team: Resolute- Mike Runner, Brian Wilmouth; WV DNR – Randall Kocis, Austin McGee; Save the Tygart – Paul and Fran Baker; WV DEP – Scott Lemons; Marion County Department of Health – Lloyd White, Janelle Smith, Joseph Manchin IV, and moderator Nakul Satyendra from WVU Public Health.